When smooth muscle in the wall of the bladder stretches, the micturition reflex (urination) is triggered. Urine produced in the kidneys travels down the ureters into the urinary bladder. The bladder expands like an elastic sac to hold more urine. As it reaches capacity, the process of micturition, or urination, begins. Involuntary muscle movements send signals to the nervous system, putting the decision to urinate under conscious control. The internal urethral sphincter and the external urethral sphincter both provide muscle control for the flow of urine. The internal sphincter is involuntary. It surrounds the opening of the bladder to the urethra and relaxes to allow urine to pass. The external sphincter is voluntary. It surrounds the urethra outside the bladder and must be relaxed for urination to occur. The bladder is shaped like a pyramid when empty. It becomes more oval as it fills with urine and expands. A smooth muscle called the detrusor surrounds the bladder, and folds called rugae line the interior wall. These structures give the bladder elasticity and allow it to expand. 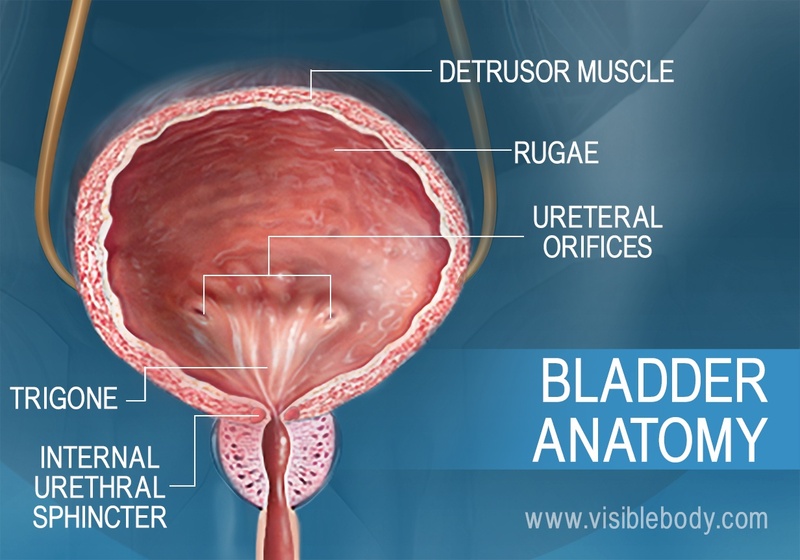 The floor of the bladder includes a funnel-like region called the trigone, formed by the two ureteral orifices and the internal urethral sphincter. Urine flows into the bladder via the ureteral orifices and out through the internal sphincter. Micturition, or urination, is the act of emptying the bladder. When the bladder is full of urine, stretch receptors in the bladder wall trigger the micturition reflex. The detrusor muscle that surrounds the bladder contracts. 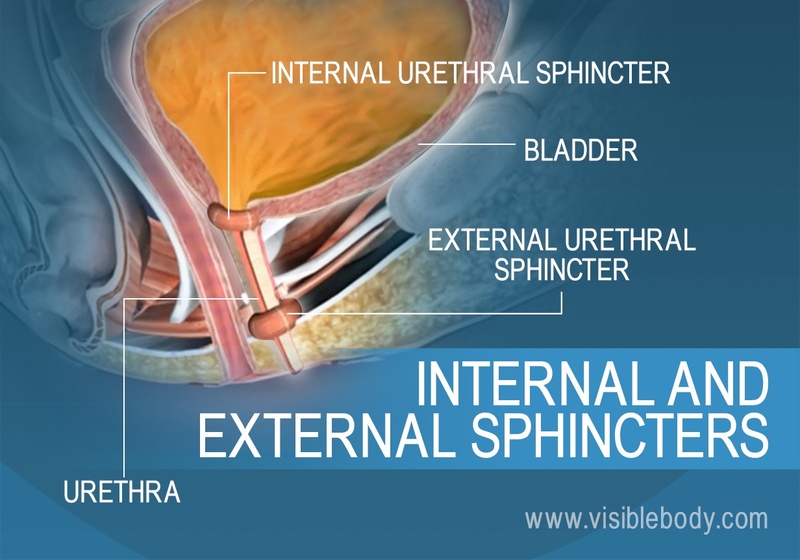 The internal urethral sphincter relaxes, allowing for urine to pass out of the bladder into the urethra. Both of these reactions are involuntary. The external urethral sphincter is voluntary. It must be relaxed for urine to flow through the urethra and outside the body. 4. How Full Does the Bladder Get Before We Have to Urinate? The bladder expands as urine flows in from the ureters, but there is a limit to the volume it can contain. At about 200 ml of urine, the detrusor muscle begins to contract and the internal urethral sphincter muscle begins to relax. 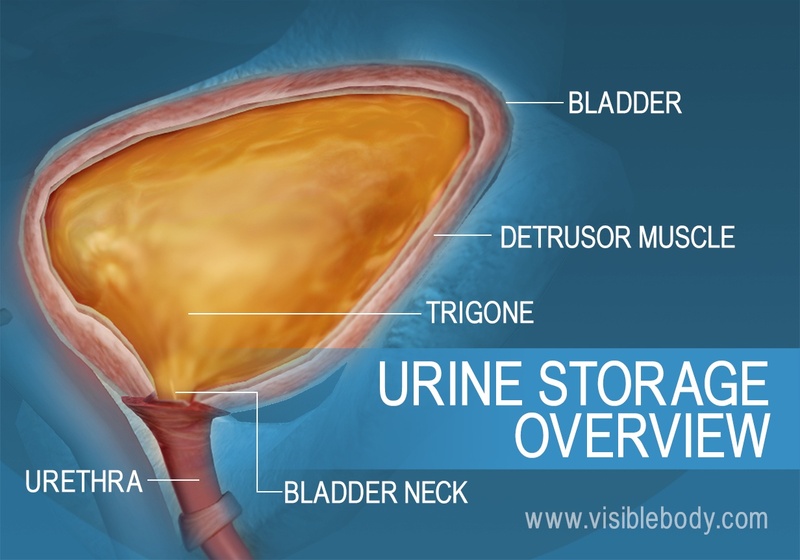 This sends signals through the nervous system and creates the “urge” to urinate. If this urge is ignored, continence may be threatened. At about 500 ml, detrusor muscle contractions begin to force open the internal urethral sphincter. Unless the external urethral sphincter is powerful enough to prevent it, micturition (urination) will occur involuntarily. 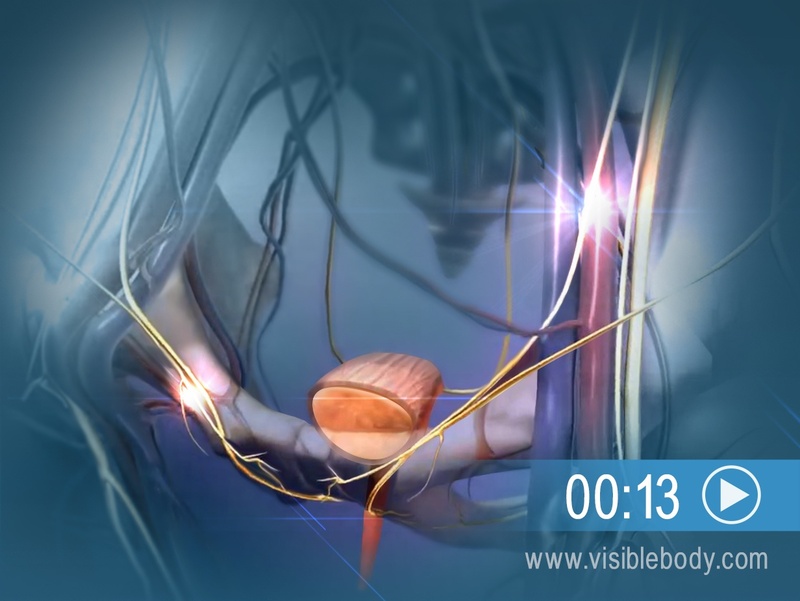 Smooth muscle stretch initiates the micturition reflex by activating stretch receptors in the bladder wall. This autonomic reflex causes the detrusor muscle to contract and the internal urethral sphincter muscle to relax, allowing urine to flow into the urethra. The stretch receptors also send a message to the thalamus and the cerebral cortex, giving voluntary control over the external urethral sphincter. We usually gain this control of urination between the ages of 2 and 3, as our brains develop. A description of the urinary bladder from the 1918 edition of Gray's Anatomy of the Human Body. Using bladder ultrasound to detect urinary retention in patients from Nursing Times.